What it’s used for: DIBAL is a strong, bulky reducing agent. It’s most useful for the reduction of esters to aldehydes. Unlike lithium aluminum hydride, it will not reduce the aldehyde further if only one equivalent is added. It will also reduce other carbonyl compounds such as amides, aldehydes, ketones, and nitriles. Like Lindlar’s catalyst, DIBAL is most notable for what it does not do. It reduces esters, but not to alcohols – it stops at the aldehyde stage. Let’s have a look. Keeping the temperature low (–70°C) tends to keep a lid on the reactivity here. So long as the temperature is kept here for the duration of the experiment and only one equivalent of DIBAL is added, the aldehyde is obtained. 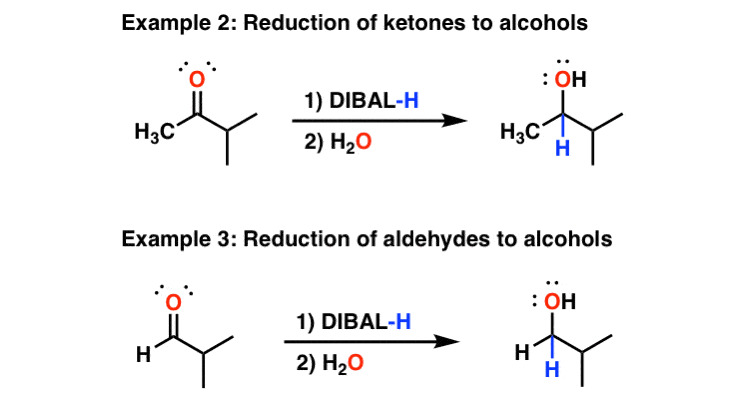 In addition, DIBAL can do all the reductions that NaBH4 does, so ketones and aldehydes are reduced to secondary and primary alcohols, respectively. Finally, DIBAL will also do partial reductions of nitriles to imines. The imines are then hydrolyzed to aldehydes upon addition of water. In this respect DIBAL again differs from LiAlH4, which will reduce nitriles all the way to amines. The mechanism for reduction by DIBAL is a little bit unusual compared to NaBH4. Whereas NaBH4 is considered a “nucleophilic” reductant – that is, it delivers hydride (H-) directly to a carbonyl carbon, DIBAL is an “electrophilic” reductant. 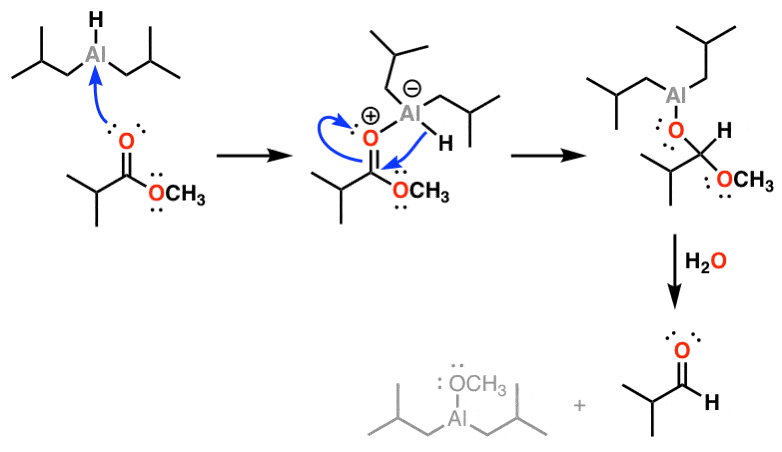 That is, the first step in the reaction is coordination of a lone pair from the carbonyl oxygen (a nucleophile) to the aluminum (electrophile). It is only after coordinating to its carbonyl host that DIBAL delivers its hydride to the carbonyl carbon, resulting in formation of a neutral hemiacetal intermediate that is stable at low temperatures. Quenching of the reaction then breaks down the hemiacetal, resulting in isolation of the aldehyde. (“real life” disclaimer: this reaction looks great on paper but can sometimes be difficult to achieve in practice). The same mechanism is in effect in the reduction of nitriles to imines (and then on to aldehydes). 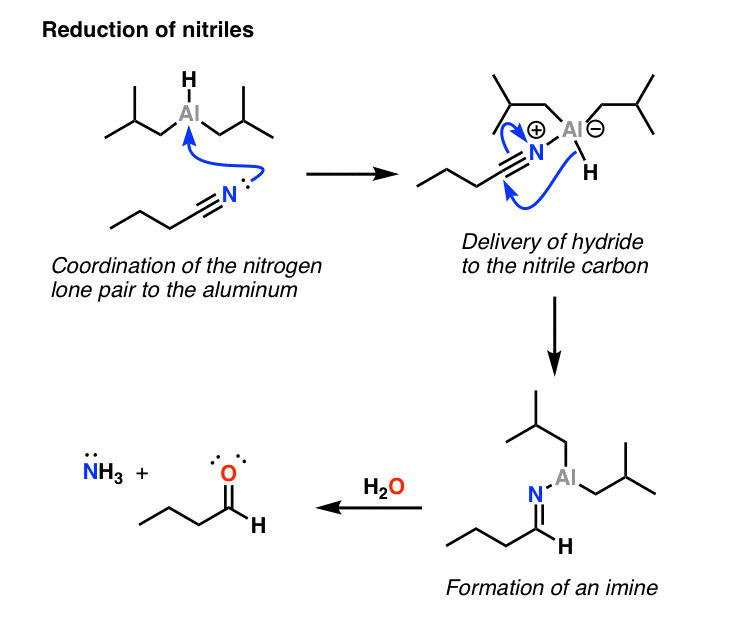 Coordination of the nitrile nitrogen to aluminum is followed by delivery of hydride, and from there, addition of water leads to hydrolysis of the imine and subsequent isolation of the aldehyde. P.S. You can read about the chemistry of DIBAL and more than 80 other reagents in undergraduate organic chemistry in the “Organic Chemistry Reagent Guide”, available here as a downloadable PDF. re: real life disclaimer. And man those hydrolized aluminum salts are some of the nastiest emulsions I’ve ever experienced! According to my dissertation, my largest DIBAL-H reduction ran on 10.1 g (17.9 mmol) in 175 mL CH2Cl2. The good news about this reaction for me are twofold. 1) The starting material is bright crayon yellow and the product was colorless. 2) The reaction was instantaneous. It was like titrating in DIBAL-H. Curiously, it always took 2 eq of DIBAL (still not quite sure why, only one equiv of H- is incorporated), but as soon as the yellow disappeared, I was sure the reaction was at 100% conversion. Sure, I’d take a TLC just to be sure, and it was always complete. Then quench the reaction with saturated aq. Rochelle’s salt (hm… TIL Rochelle was the city in which it was discovered, not the name of the guy) to help break the Al emulsion. Our lab also found empirically that diluting the CH2Cl2 reaction with a LOT of Et2O helped break the emulsion. The bad news is you had to let this biphasic mixture stir vigorously for at least 90 min-2hr before separating the layers. As long as enough Et2O was added, the emulsion broke down and separation became very manageable if stirred long enough. I’ve done a few DIBAL reductions this year and often had trouble with them – in particular, if your product is water soluble and loves the aqueous phase in a work-up (one can never quite tell), then it’s an absolutely horrible to job to try and recover it from a saturated aqueous phase full of Rochelle salts. Somebody recommended to me that the Fieser work up followed by a filtration over Celite should remove the Al salts emulsion just as well. I am probably going to use this method as a first choice from now on, because trying to extract my product from Rochelle salts solution caused me a lot of grief! Also, having re-read this site properly, I will now always use H2O to quench my DIBAL reductions of nitriles. I mistakenly used methanol earlier on and looking at the mechanism of imine hydrolysis above, that might explain why I got a nasty mixture of crap when I quenched the imine with Methanol! Guess I can just pour the reaction on to water at 0 Celsius, rather than quenching direct at -70. I personally was not able to obtain an aldehyde on the one occasion I tried DIBAL. Part of the problem was likely the scale (<25 mg) and titre of the (old) DIBAL, as well as not choosing the solvent well (should have used CH2Cl2 instead of ether). So I just re-oxidized the alcohol with DMP and was done with it. Aluminum salts are notorious for their bitching emulsions. For DIBAL I made sure to stir with Rochelle's salt for a good long while. For LiAlH4 I always use the Fieser workup and filter off the solid… no extraction required, thank goodness. To be complete, I wasn’t reducing an ester, it was a thioimide. It was an (OH-protected) aldol adduct utilizing a thiazolidinethione as a chiral auxiliary. We developed the conditions for the aldol addition in our laboratory. Suffice it to say we did the diastereoselective aldol addition a lot. Partial reduction of the thioimide to the aldehyde was a common next transformation, so we always had a fresh bottle of DIBAL in the fridge. I reduced 5 different thioimides this way who knows how many times as I ran through the synthetic scheme who knows how many times. The one time I did reduce an actual ester, it was on 0.7 g scale (2.4 mmol). 68% yield of aldehyde, 30% yield of alcohol. Also reoxidized the alcohol with DMP back to the aldehyde in 63% (or 87% total from ester -> aldehdye) That reduction was following a Frater-Seebach alkylation (which was a pain to run (-40 degC, 3 days), but a great reaction to have experienced. Is it not DIBAH instead of DIBAL? It can be referred to as DIBAH, DIBAL, or DIBAL-H. Usually when discussing it amongst themselves, organic chemists call it DIBAL because it rolls more easily off the tongue than either of the other two. Can we obtain alcohol from ketone, by DIBAH at –70°C? I know we can at room temperature, but I don’t know if we can at –70°C. Any reference you have? Under the acidic conditions, convert the aluminum salt to the hemiacetal. Don’t worry, students have this problem all the time because, well, they just do. When we grade quizzes, students freak out when they see the hemiacetal under acid conditions and they are unable to figure out what to do next. Then the students proceed to use OH- because remember in student parlance, OH- is always available in acidic solution. I use 2,5-3,5 eq to reduce my esters to alcohols. So no, it doesn’t stop at aldehyde, it’s actually more difficult to stop the reduction at aldehyde than to continue to alcohol. thats because you use more then ONE eq. Does your DIBAL acquire an extra carbon atom when it coordinates the oxygen? what can be degraded product of DIBAL-H ? Does this also reduce carboxylic acids? No, DIBAL-H does not react with carboxylic acids. You have two options: perform an esterification of your -COOH to -COOMe for example and then use DIBAL-H, or you can use the -COOH directly with another reagent like LiAlH4 or NaBH4. Just using 1eq would not help anyway as the aldehyde is more facile to reduce than the ester. Dibal has another trick up its sleeve. If you have an a,b-unsat. ester or ketone, it can cleanly reduce without affecting the double bond. Unlike NaBH4 or LAH. Actualy, I have just used 2 eq. of DIBAL by accident in calculating and got 100% of alcohol and not a trace of aldehyde, so I wouldnt be so hasty with more than 1 eq. In the last step of preperation of aldehydes from alkyl nitrile, how ammonia(NH3) is formed – I mean , where is an additional hydrogen proton (H+) available to form NH3? Thanks in advance. It would come in the workup step when water is added. There’s excess water. I want to reduce an ester to an aldehyde. I’ll try DIBAL at -78°C in DCM. If it doesn’t work, I’ll do the reduction to alcohol then oxidize with PCC. 1) I thought non polar solvent would make the reaction slower. Then should I use toluene instead of DCM ? 2) If going to alcohol, why -78°C ? Can’t I do it at 0°C ? And should I add the ester to the dibal or the opposite ? 3) Last question, if I go to aldehyde, can I quench with methanol ? Water will be frozen at -78°C. Also, what do you think about the paper adding NaOtBu to Dibal to reduce to aldehyde at 0°C ? I’d look for a prep online where someone successfully reduced an ester to an aldehyde. For example, if you go to the ACS Publications home page, search for “ester dibal reduction aldehyde total synthesis ” . You’ll come up with some reputable papers with supporting information. Use those conditions. If you want the aldehyde, you MUST keep it at -78. A non polar solvent is ideal. Avoid ethereal solvents (they tend to coordinate to the aluminum and this can affect reactivity), DCM should be fine. Toluene can present solubility problems, but might be OK for you at -78. If you are aiming for the alcohol, then warming is fine. I haven’t come across the paper you mention at the end. DIBAL reduction produces O(-) which itself is a strong base. The formation of the C-O double bond along with expulsion of CH3O(-) is therefore not accompanied by a huge energy barrier. CH3O(-) is not a great leaving group, but still a much better one than H(-) or most carbon-based leaving groups. I was also wondering if DIBAL-H can be used to reduce carboxylic acids?! If it does, would the product be an aldehyde like it is when we reduce an ester with DIBAL-H? You’d really have to crank on it. It’s possible, but you’d have to use over 3 equivalents and heat it up. It’s far superior to use LiAlH4 ! Did “dibal h ” reduce acid chlorides? Yes, it should give an aldehyde. Is it possible to reduce ethyl ester to aldehyde in presence of an aromatic nitro group? It’s inefficient. LiAlH4 is considerably cheaper and you have to use fewer equivalents of it. So.. using DIBAL-H on an ester, gives us an aldehyde. What about the other organic part of the ester? [RCOOR’] What about The R’ part? We get an Alcohol [OR’] I suppose? You can break the aluminum complex by refluxing in methanol. DIBAL 2 eq. at zero deg reduces ester to alcohol. 1 Eq DIBAL at -78 reduces esters to aldehyde. those reactions are clean. yields are more than 90 %. after refluxing with methanol one can do celite filtration and concentrate the methanol extract..no need to even do a column. Of course there should be no other competing groups. In my experience getting it to stop at the aldehyde can be capricious and quite solvent dependent. Refluxing in methanol seems extreme… why not just use Rochelle’s salt like everybody else?